Depending on your reactor size and agitation requirements, DDPS offers Series 60 Drives or Lenze Drives that are designed to meet the special needs of glass-lined process vessel users. Large diameter, preloaded tapered roller bearings provide optimum blend of rigid shaft support for very low runout with low-profile design. Long L10 bearing life: 100,000 to 500,000 hours for output shaft bearings. Quality 10 helical gearing: no low- efficiency worm gear to heat up or belts to slip. Minimum numbers of parts, simplified construction and rugged, rigid ductile iron housing. Extremely low noise level. Series 60 is optimized for use over the entire working temperature range of a glass-lined reactor with a “non-metallic” shaft seal. There are two optional mounts – an angular-offset drive exceptional top-to-bottom turnover without costly baffling; or vertical-mounted drive for dependability and performance. 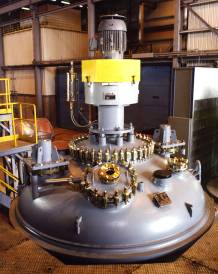 The DDPS Series 60 drive can be retrofitted to any major brand reactor. Lenze drives are optimized for use over the entire working temperature range of a glass-lined reactor with a “non-metallic” shaft seal. 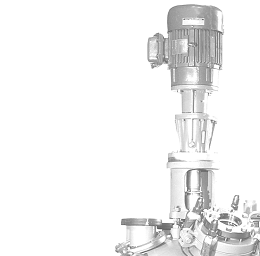 The DDPS Lenze drive can be retrofitted to any major brand reactor.